To begin this quest, speak to Father Aereck located in the Lumbridge Church. The church can be found just southeast of the entrance to the Lumbridge Castle courtyard. If you're not in Lumbridge, the quickest way to get there is by teleporting with either the Lumbridge Home Teleport spell or the Lumbridge Teleport spell (level 31 Magic). From the teleport point, simply leave the courtyard and head a short distance southeast until you find the church. You will find Father Aereck inside the church. Speak with him and tell him that you are looking for a quest. It just-so-happens that he is in need of an adventurer such as yourself to help him. Agree to assist him and he will tell you that the church graveyard is being haunted by a ghost, and that he would like you to find a way to get rid of it. Father Aereck also suggests that you find Father Urhney and tell him about the situation. Father Urhney is located in the Lumbridge Swamp, south of Lumbridge. Leave the church and exit the city using the path through the graveyard behind the church. Continue south along the path until you reach a Mining area, after which you should head west until you find a small house. Once you find the house, go inside to find Father Urhney. When you first speak with him, he seems rather upset that you are disturbing his meditation. Tell him that Father Aereck sent you, and then tell him about the ghost that is haunting the graveyard. He can't leave his meditation, but he gives you a Ghostspeak Amulet and tells you how to exorcise the spirit. Essentially, ghosts are trapped until they complete an unfinished task. You must find out what that task is, and help the ghost to complete it so he (or she) can move on. Head back to the church graveyard and enter the small shed in the southeast corner. Inside you will find a coffin; open it and a Restless Ghost will appear. 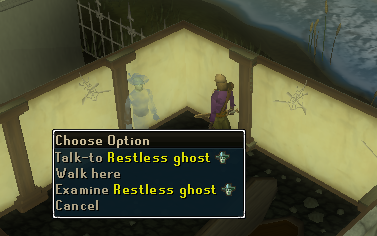 If you haven't already, equip the Ghostspeak Amulet and speak to the Restless Ghost. After some initial surprise that a human can actually understand him, the Restless Ghost will tell you that he was Mining ore at the Mining area south of Lumbridge when he died and lost his head. He asks that you find his skull and bring it back to him so that he may finally rest in peace. 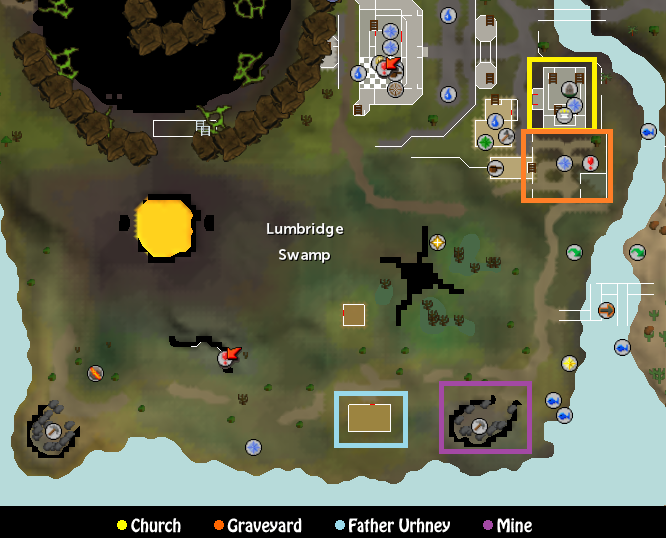 Now head back into Lumbridge Swamp, following the path south until you reach a Mining site. You will find some Rocks slightly east of the Mining area. Search the Rocks to find a Muddy Skull. 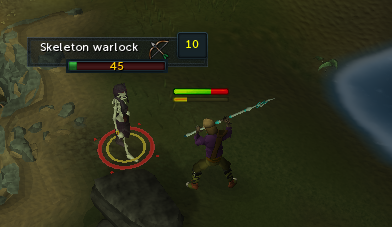 You will immediately be attacked by a level 10 Skeletal Warlock who attacks with Magic. Killing the skeleton is completely optional and yields no extra rewards. Head back to the graveyard and open the Coffin inside the shed. Now open the Coffin and use the Muddy Skull on it to place the skull inside. A short cutscene will ensue, and the Restless Ghost will thank you for finally putting his spirit to rest. 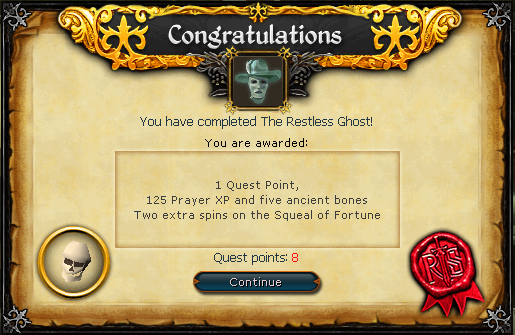 125 Prayer experience 5 Ancient Bones which can be buried to each 200 Prayer experience each. You may keep the Ghostspeak Amulet from the quest. Another may always be obtained from Father Urhney if you lose yours. Access to the Gravestone shop run by Father Aereck. 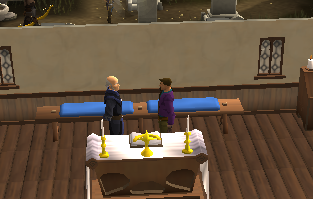 [^] Speak to Father Aereck in the Lumbridge Church. 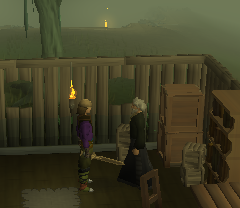 [^] Speak to Father Urhney in the Lumbridge Swamp to obtain a Ghostspeak Amulet. [^] Open the Coffin in the church graveyard and talk to the Restless Ghost. 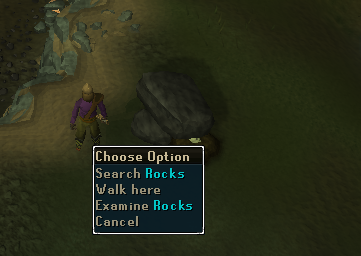 [^] Search the Rocks located near the Mining site in the southeast corner of the Lumbridge Swamp to obtain a Muddy Skull. 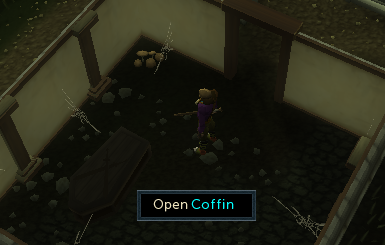 [^] Open the Coffin in the church graveyard and use the Muddy Skull on it.